Leaders are always ahead of the game in the process of change. They have to be. They came up with the idea, or quickly embraced it. Everyone else is at least one step behind. That’s just the way it works. However, growing building program support for church transitions requires everyone, or at least a large number of the congregation to also get on board. Inevitably, there will be people who miss all the announcements, don’t check their e-mails, and never read the newsletters. They will demand to know, “What the heck is going on?” and “When did this happen?” just when the leadership is ready to move to the next stage. In order to build support for any plan, particularly a building program, you need to actively manage that time of transition in the church. Plan carefully. People don’t intentionally come into the conversation late; they just have other things going on in their lives. In order to make sure to gather people into the process of change as a positive experience, plan for what is called “staggered onboarding”. If you don’t do this, you will create a group of resisters - guaranteed. Don’t keep secrets. Not everyone needs to know everything, and you don’t need to have absolute agreement. However, you do need to let the whole congregation know what the leadership is talking about at every major stage of a possible building project. You are going to need their support and their funding, so why keep it a secret? Determine your timeline. Plan to start talking about building at least year before you hope to begin any start of construction. Distribute a timeline and use it to start setting realistic expectations about when and where decisions will be made. Consult with professionals early to set realistic timeframes. Think about this in terms of sending your child to college. This project is a major expense and you want to get it right with as few surprises as possible. A big part of everything going smoothly comes from planning well and early. Invite comment at the early stages. Unless your community makes decisions using a consensus model, not everyone will get a vote. However, everyone should have a voice. Kids who use the youth room will have noticed things that the adults may not. People with mobility difficulties, or who are shorter than average, or who are musicians or liturgists all have particular insights to share. Have a visioning retreat. This allows all those involved in the planning to bond and build excitement for the project. This emotional underpinning is important for getting through the inevitable construction bumps with a bit more calm. 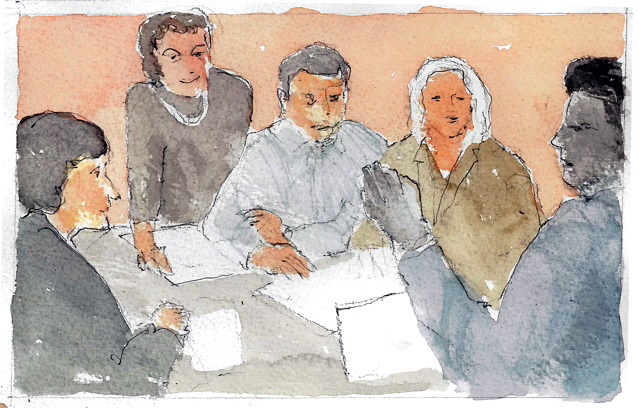 See Heimsath Architect’s great blog post on the master planning process for ideas. Invite more input and publicize the general results. Get the word out as progress happens. You don’t need to attribute specific comments to specific people. It’s not necessary to the end result, and can cause some difficult feelings between individuals who do not see eye to eye. Plan on nostalgia. With every change there is an internal measuring process we go through. How does this new thing stack up against the past? Until people are comfortable with the new, some will remember the past with more fondness than accuracy. That’s just the way it goes. Try to make the comparison work for you - if the image of the future is better, people will be willing to work to achieve it. Engage a new group of people into the process. Welcome those who are new to the conversation and celebrate their interest. Don’t berate them, or push them aside because they were late to the party. Extend an open hand to everyone, even to those who might have opposed you in the past. Publicize some more. Keeping people informed about the preparations keeps anxiety down and anticipation up. By the time your leadership is tired of hearing about the project others may only just be noticing. Celebrate. Marking stages of life is the rhythm of living faith. A major building project has stages. The process of change, particularly for building change is unique in the life of the congregation. People may be remembering your work for decades to come. Celebrate this as you would any major faith event. Create a prayer service, a dedication, a party connected to the transition to mark each significant element. Guest blogger Laura Lincoln, an expert in managing church change will be contributing a series of blogs dealing with early issues of conflict in planning for a major building program. Laura Lincoln, MA, MS is a theologian and organizational psychologist who has served as an intentional transitional minister, organizational development consultant, professor of Christian Worship, and campus minister. She has worked as a consultant for churches of various denominations in both the United States and England, is the former Executive Director of the Texas Conference of Churches, and the current Director of People and Organization at St. Theresa Catholic Church in Austin, Texas. Laura studied at/has degrees from Walden University, Yale University Divinity School, St. John's School of Theology (Collegeville, MN), Gettysburg Seminary, and the Lutheran Seminary Program in the Southwest.